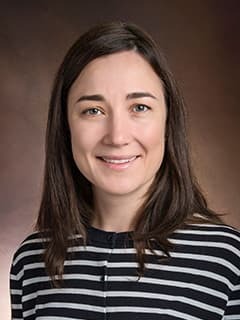 Sarah Geoghegan, MB BCh BAO, is a pediatric infectious diseases fellow in the Division of Infectious Diseases at Children's Hospital of Philadelphia. Rajan D, O'Keefe EL, Travers C, McCracken C, Geoghegan S, Caballero MT, Acosta P, Polack F, Anderson LJ. MUC5AC Levels Associated With Respiratory Syncytial Virus Disease Severity Clin Infect Dis. 2018 Jun 6. doi: 10.1093/cid/ciy340. [Epub ahead of print]. Geoghegan S, King G, Henchliffe J, Ramsden SC, Barry RJ, Green AJ, O'Connell SM. A sibling pair with cardiofaciocutaneous syndrome (CFC) secondary to BRAF mutation with unaffected parents-the first cases of gonadal mosaicism in CFC? Am J Med Genet A. 2018 Apr 28. doi: 10.1002/ajmg.a.38725. [Epub ahead of print]. Geoghegan S, Erviti A, Caballero MT et al. RSV mortality burden and risk factors. American Journal of Respiratory and Critical Care Medicine 2017 Jan 1; 195(1): 96-103. Atwell JE, Geoghegan S, Karron RA, Polack F Clinical predictors of critical respiratory syncytial virus (RSV) illness in infants and children: data to inform case definitions for efficacy trials. Journal of Infectious Diseases 2016 Dec 1; 214(11):1712-1716. Geoghegan S, Walsh A, Leahy R, Gavin P, Butler K. Anti N-Methyl-D-Aspartate Receptor Antibody encephalitis complicating Herpes Simplex virus encephalitis a case series. Pediatr Infect Dis J. 2016 Aug; 35(8):e258-61. Geoghegan S, Nicholson AJ, Molloy EJ. Incorporating Teaching in Global Child Health into Irish Medical School Curriculum. Ir Med J. 2015 Jul-Aug; 108(7):194. Geoghegan S, Vavasseur C, Donoghue V, Molloy EJ. Easily missed potentially fatal complication in an extremely preterm infant. BMJ Case Rep 2014 Jul 22; 2014 pii: bcr2013201397. Geoghegan S, Foran A, Twomey A, Murphy BP, Clarke T, Regionalization and neonatal networks. Ir Med J. 2012 Jul-Aug;105(7):249. Geoghegan S, McGuire BJ, Groarke P, Shaw C, Fabre A, Fitzpatrick JM, O’Malley KJ. A rare benign renal tumour presenting as polycythemia in a teenage girl. Ir Med J. 2010 Apr; 103(4):122-3. Geoghegan S, Ulloa E, Kitt E. Aseptic abscesses in an immunocompromised host. European Society of Pediatric Infectious Disease, Poster presentation, Annual Meeting, May 2018.